After discussing this with Avery, it was decided to move all the tutorial aspects of this off of the LPF server - so as to exonerate Avery of any legal responsibility. Before we begin, it should be noted that I am the copyright holder for this code - it was written entirely from scratch by me, other than the pre-existing libraries that were included with the PIC compiler I used. No compiled code was disassembled or analyzed in the making of Ellipsis. This project was born out of desire to add functionality to my own LaserBee. It's now evolved into a push to develop an entirely new firmware package for the LaserBee. I've not yet determined whether or not this should be open-source. Input on this issue is welcome. The main thing that is needed right now is data. 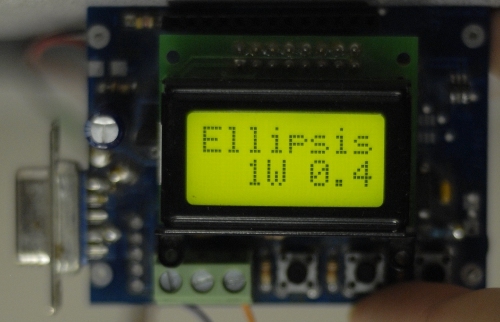 In order to complete the project, it would be necessary to test the readings calculated by Ellipsis against readings taken by the original firmware, so that anyone who wishes to run Ellipsis can get the added features they want while still getting valid data. Donations welcome but not necessary. As a little proof of concept, here are the first photos of Ellipsis in action, on my 1W LaserBee. Video to come as soon as possible. Already, I've made significant progress towards improving the functionality of my device. Proper LCD Initialization - Now, no row of black rectangles appears upon startup. 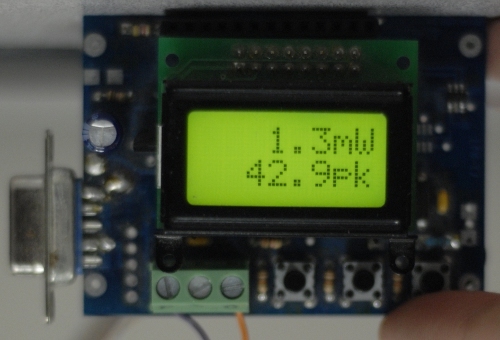 Higher Precision - The device now displays readings out to 0.1mW. More testing will be conducted to explore the accuracy of this figure. Curve Adjustment - This is the big one. This is needed to make this project viable. Rich Customization - Easy access to settings such as backlight state, calibration, and other useful settings. Make use of the on-board buttons. Been too busy working on other facets of the firmware to actually do this. This is somewhat of an ongoing project; this thread will be used for news, updates, and dissemination of any relevant media. wut u did thar, i c it. Will they be able to read higher power numbers then previously allowed? I don't get it. The Croat is lost here. On-topic: Damn Trevor, you sure love coding Nice work. Ellipsis - a series of marks that usually indicate an intentional omission of a word. Thanks but I got it in the meantime! And as words go, it's pretty cool. And fits on an eight-character LCD. So, without the curve adjustments, roughly how (in)accurate is this firmware at the moment? And for the maximum range: to what DAC number does this overflow point of 4.7v correnspond? Is there much room left, or its it already using all 12 bits? When I tested it, it read about 5mW high when measuring a 5mW laser, and about 5mW low measuring a 550mW laser. I've sent an email to one of the professors I know in photonics. I'll get in the lab here soon and test it over the full range. I won't be messing with any limits that preserve the LPM components. Considering you're reprogramming anyway, is it possible that you could look into the mathematics of the heating of the sensor and then function map the rise based off of inputs at different times and predict the maximum output? Having an LPM that doesn't take 30 seconds to take a 500mW reading would help GREATLY in preventing countless new people thinking their 445nm laser has a half a minute warmup. Indeed. And every laser would essentially have the exact same type of function, and it should be easily solvable given a few good results at various times. It's a simple second order differential equation, methinks. Also - Trevor, I wouldn't mind tackling some of the mathematics if you don't have the background for it (even though most people good at programming are also brilliant at math).